“Since launching in 2010, Batman-News averages 2 million page views a month, while its Twitter handle boasts 94,000 followers. Perhaps more impressive is the level of engagement among its readership. Articles garner hundreds of comments, while a link from Batman-News can move the needle on much larger and more established sites. The entire story is worth reading and provides a glimpse into Batman-News’ origin story, both the successes and challenges from cultivating an audience, and their plans for the future. Truth be told, we weren’t surprised when The Hollywood Reporter recently profiled Chris and Batman News. Just last year, we featured the site that included an interview with Chris and a Q&A discussion with their team after it was selected by the community as the best comic book website. Since being anointed this prestigious title, Batman-News’ successful run continues as its coverage and readership steadily expands. We just hope Chris remembers us when he gets to interview Ben Affleck on the red carpet. 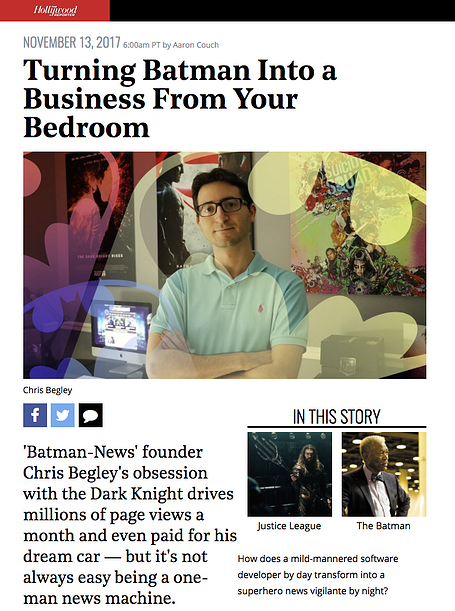 Batman News provides a great case study for all publishers looking to engage their readers and cultivate a loyal audience. Here’s what you can learn from Batman-News. So much content exists on the Internet today which makes it harder than ever for a publisher to differentiate itself. And if you have a small team (or a mostly solo-operation like Chris at Batman-News), you’re greatly limited by the scope of your coverage. Instead, focus on the topic you are most passionate about and be the best at it. It’s better to have 10 highly devoted readers who follow everything you write than a thousand who visit maybe once a month. As you acquire more loyal readers, recruit a team and empower readers to help scale your effort. For Batman-News, this meant obsessively being the best at just one thing: delivering all relevant Batman news in a single place for readers to discuss it together. Because their team regularly interacted with readers in the comments, Chris also learned about the topics that resonated the most, allowing him to further refine his coverage. Building a community around your content should be a priority from day one. Cultivating a community doesn’t happen overnight and there are no silver bullets to fast track your way there either. You have to get readers involved from the beginning and establish a connection with them. Listen to their feedback, connect your content to your community, and turn comments into content. When Batman-News launched in 2010, they used Disqus to facilitate discussions on the latest Batman news with readers. They made a point to regularly to ask readers questions in their stories to get discussions going. By committing to building a community early on, this cemented their reputation as a site that puts their community at the forefront of everything they do. There’s more than one way to attract a readership on the Internet. You could pursue a strategy that focuses on having the most comprehensive coverage, being the first to report the news, or publishing super high-quality content. But if you want your readers to come back and stay around longer, you need to foster a sense of community. Start replying to comments, highlight the best ones, and host events that get readers participating. We know how important it is to forge direct relationships with your readers and one of the best strategies to achieve that is through engagement. 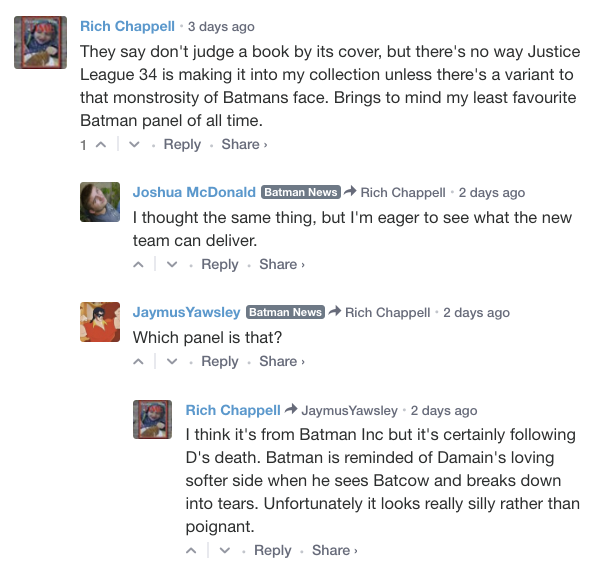 It’s not uncommon to see writers on Batman-News replying to readers’ comments on their stories. They take the time to answer questions, get feedback, and be an active part of the conversation. When the new Justice League movie debut, the site invited readers to talk about the movie after they had seen it in theaters. This wasn’t the only place on the Internet for fans to talk about the movie but Batman-News readers convened together because they enjoy being part of a passionate community that loves Batman. 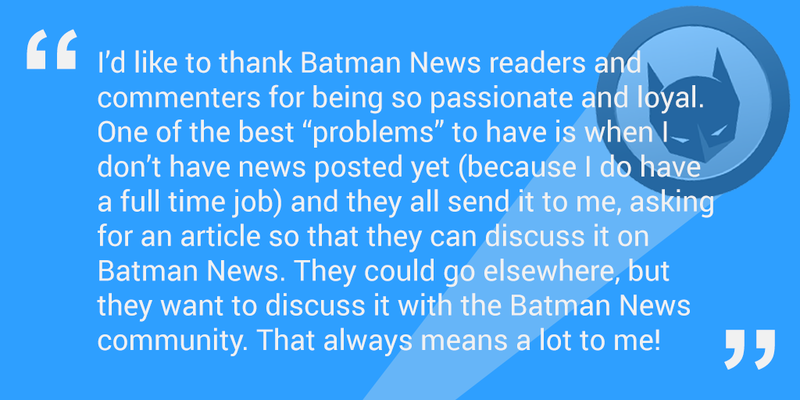 At Disqus, we help publishers like Batman-News grow on the web. The tactics and strategies they used to be successful are no hidden secret and can help publishers like you achieve your reader engagement goals.